interred in the cemetery. 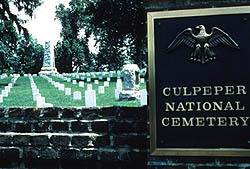 The cemetery was established in 1867 for the burial of more than 2,000 Civil War soldiers. The Second Empire-style superintendent's lodge was built in 1872 from a design by Quartermaster General Montgomery C. Meigs. 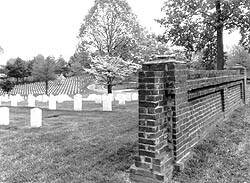 In 1978 the Veterans of Foreign Wars donated adjacent land that doubled the size of the cemetery and relieved pressure on Arlington National Cemetery. The cemetery is in active use for the burial of veterans of all wars and their dependents.